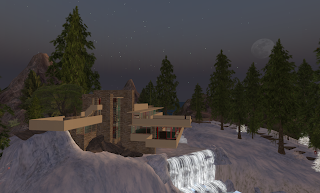 I had been meaning for some time (this always happens...) to blog about the Frank Lloyd Wright Virtual Museum, an extraordinary museum located in Second Life, licensed by the Frank Lloyd Wright Foundation to display the architect's works, supplemented with displays about his life, his philosophy, and a modest shop. As someone who works in and around the museum world in real life, I wasn't expecting much when I first set foot here a couple months ago, but I was not only surprised by the elegance and care of the installation—how beautifully done!—but also the dedication and sense of mission projected by the staff, who were clearly knowledgable, engaged and moving forward. The virtual museum had created replicas of several of Wright's best known works, including Fallingwater, which in real life is located in southwestern Pennsylvania. I've not seen the "real" Fallingwater, but I have to admit my breath was quite taken away when I saw the virtual one. "This is why people are so amazed by it!" I thought to myself as I cammed around, admiring the water and the flow of the architecture. (It made me want to get in a car and drive to see the real thing!) Also at the museum are thoughtfully executed installations on Wright's work and life. Sadly, all this has come to naught, as the Frank Lloyd Wright Foundation, which had previously granted a license to the SL museum, has now, because of stupidity, short-sightedness or greed (or maybe a combination of all three) sent a cease and desist letter, revoking all rights to Wright's work. 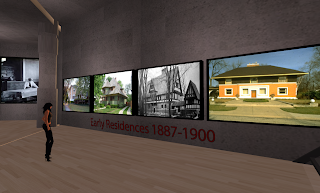 So the virtual museum will close at 6 pm SLT on December 5th, a great loss to scholars and students of architecture and anyone who loves Wright's work. (I'm fortunate to know a couple members of the Wright family, and although I haven't talked with them about this I can't imagine they would want to see this remarkable virtual museum close its doors.) Remarkably, my friend Ethan Westland, the chairman of the virtual museum, says with optimism, "There are always possibilities...We will rebuild the campus as something new...The outpouring from the virtual world has energized us all." More power to you, Ethan. And shame on you, Frank Lloyd Wright Foundation!